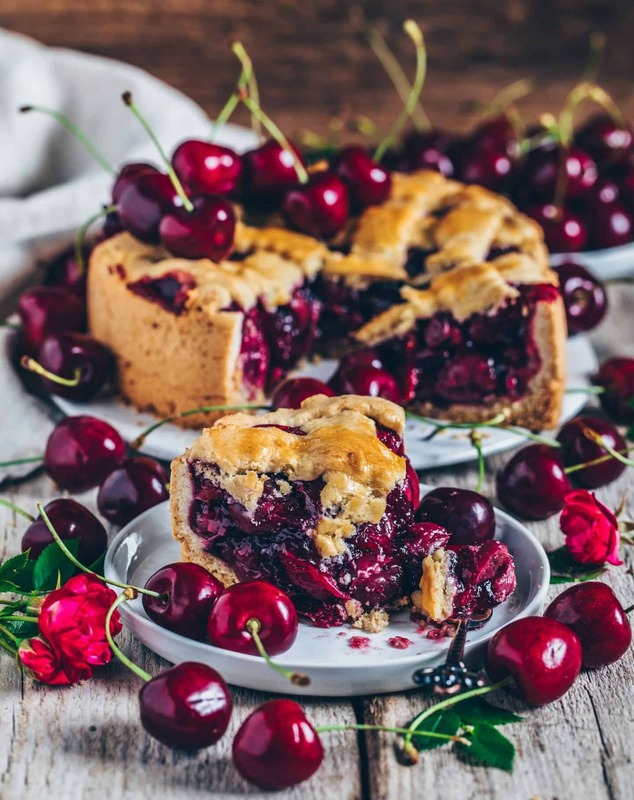 This classic cherry pie with an incredibly juicy, moist & fruity cherry filling is easy to make and so delicious! The crust and the filling are vegan and you only need a few simple ingredients. Juicy, fruity, moist and sooo delicious! 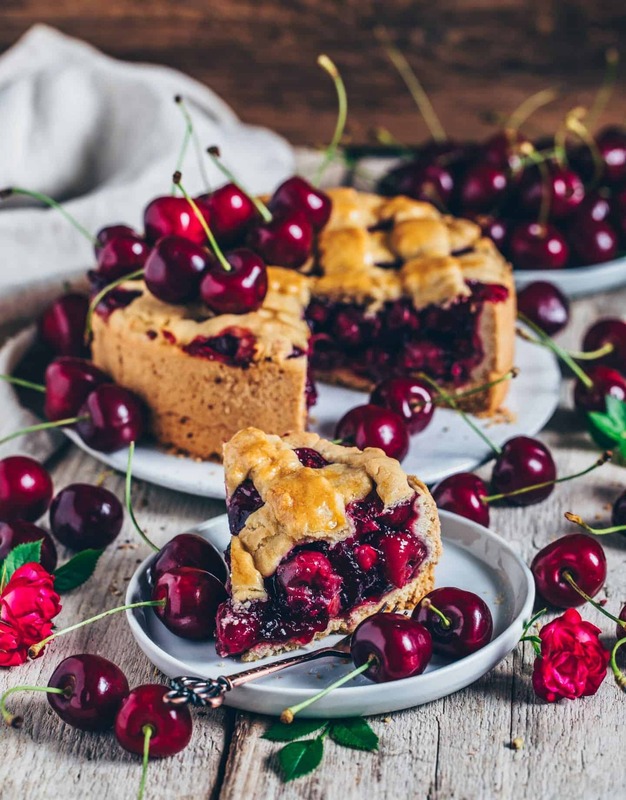 That’s the best way to describe this vegan cherry pie. 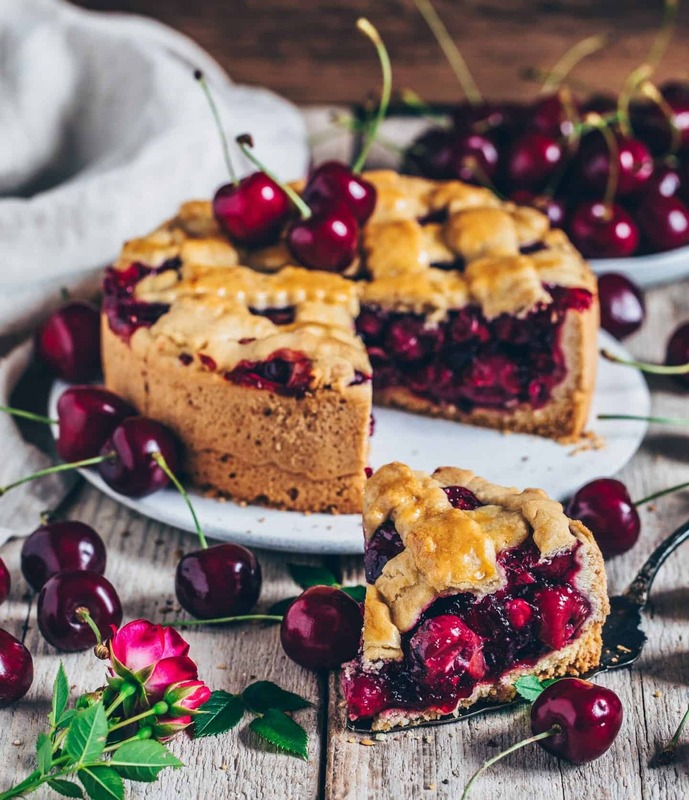 This cake is made of a buttery biscuit-like crust and a filling of cherry compote. It’s vegan, contains no white sugar and it’s a perfect dessert for a cozy afternoon. 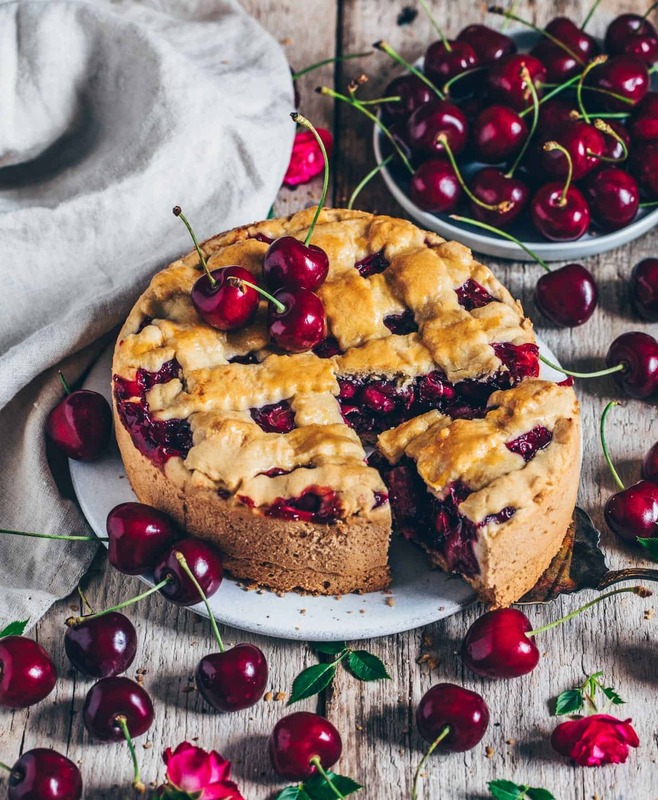 Honestly, this homemade cherry pie is even my second favorite cake after cheesecake. I’ve already tried a few similar recipes, but I think this is definitely the best! You do not need any fancy ingredients for this recipe and the cake is made easy and quick. 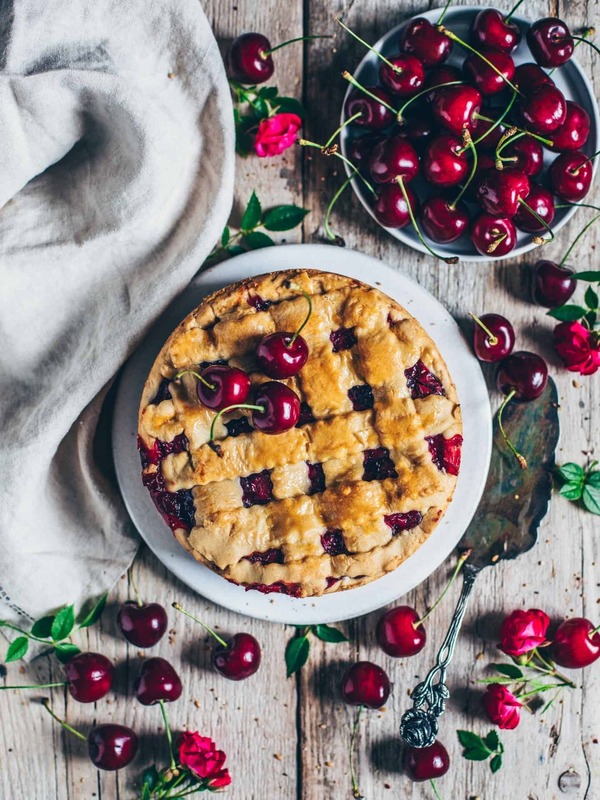 How to make a perfect vegan cherry pie crust – soft, flaky and crisp! I usually use a similar recipe for my cake crusts. It‘s only made of wheat or spelt flour (I always variate, but both options work great), plant-based vegan butter (Alsan), raw cane sugar, baking powder and a little ground vanilla. Instead of Alsan you can also use margarine and instead of raw cane sugar you can choose agave syrup or any other sweetener. With today’s recipe, I’ve also added some applesauce as an egg substitute. Optionally, you can also use banana puree, or another egg substitute of choice. You can also omit the egg substitute completely, but I think this makes the dough a little softer. To make the dough, I recommend using cold ingredients. Best is to cut the vegan butter (or margarine) into small cubes and place in the fridge for about 15 minutes. Cold ingredients are important because the longer you work with the dough, the warmer and stickier it gets. The more the butter melts, the harder it will be to work with it. That’s also why you should chill the dough for at least 30 minutes before rolling out. Then it’s easier to roll out and press into the springform. However, also be careful not to over process the dough. Because too much kneading results in a tougher crust. And we don’t want that! We want a dreamy, flaky, crisp texture. 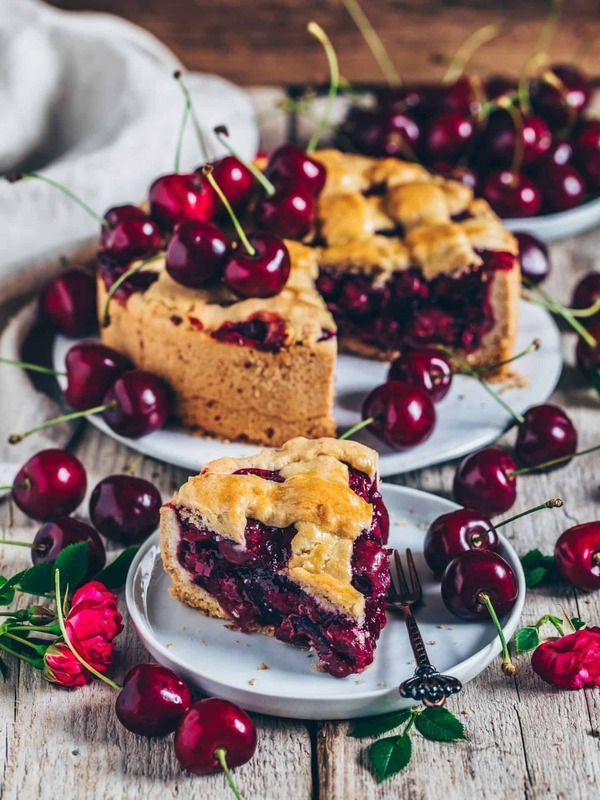 Cherries are not only incredibly delicious, they are also healthy because they are rich in vitamins and antioxidants. Also, they look so pretty and are a great eye-catcher. I easily cooked the cherries with some cherry juice and thickened them with starch to make a compote. You can use fresh cherries or just cherries from the glass. Of course, if you choose fresh cherries you have to core them. For that, using a cherry pitter is great, but it works also with a simple kitchen knife. Just cut a straight cut along the core and then you can carefully turn the cherry halves apart and remove the stone with the knife. I also sweetened the cherry compote with some agave syrup. The amount of extra sweetness depends on which type of cherries you use and how sweet you like it. Once all the ingredients for the filling are mixed, it’s best to try it and decide if you want to add more sweetness. Mix flour, baking powder, sugar, vanilla and salt. Add applesauce. Sprinkle the vegan butter (or margarine) over the flour mixture and knead everything quickly to a smooth dough. (If needed, add a bit of cold plant-based milk). Then form the dough into a ball, wrap in cling foil and put in the fridge for at least half an hour. Afterwards, remove the dough from the fridge. Roll out 2/3 of the dough on a floured surface and spread evenly in a 18 cm greased springform. Press the dough while pulling up the sides (approx. 2-3 cm). Drain the cherries from the glass (save the cherry juice) or core fresh cherries. Stir cherry juice with starch and sugar / syrup in a small saucepan and bring to a boil. Add the cherries (cook fresh cherries for about 5 minutes) and let cool. Spread the filling on the pre-baked crust and smooth it out. Roll out the remaining dough and cut into 1 cm wide strips. Lay the strips crosswise like a grid on the cake and cut off the overlapped edges. Brush the dough grid with some plant-based cream or milk. Bake the cake on a medium rack for about 20 minutes until golden brown. Before serving, sprinkle with some icing sugar if you like and serve with vanilla ice cream, coconut cream or simply pure. You can also prepare the dough for the crust the day before and then chill in the fridge overnight. You can also freeze the dough. I prefer using Alsan, but you can use any other margarine as well. Instead of applesauce you can also use 50 g pureed banana or another egg substitute of choice. But the recipe also works without any egg substitute. 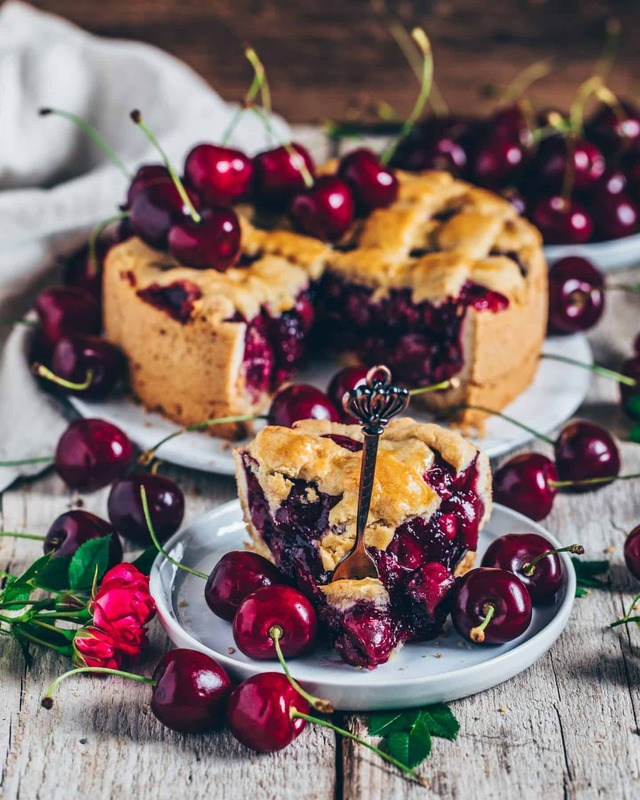 The amount of sweetness for the filling depends on how sweet the cherries are naturally. 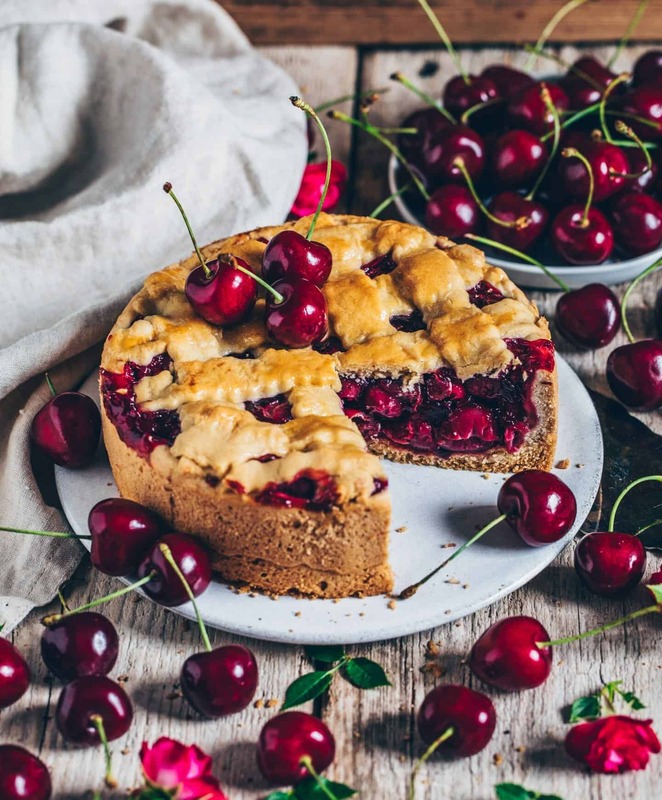 For sour cherries, I recommend adding more raw cane sugar or agave syrup. The cake also turns out well without pre-baking the crust. The full baking time is then about 40-45 minutes. If the cake gets too dark in the meantime, cover with a piece of baking paper. 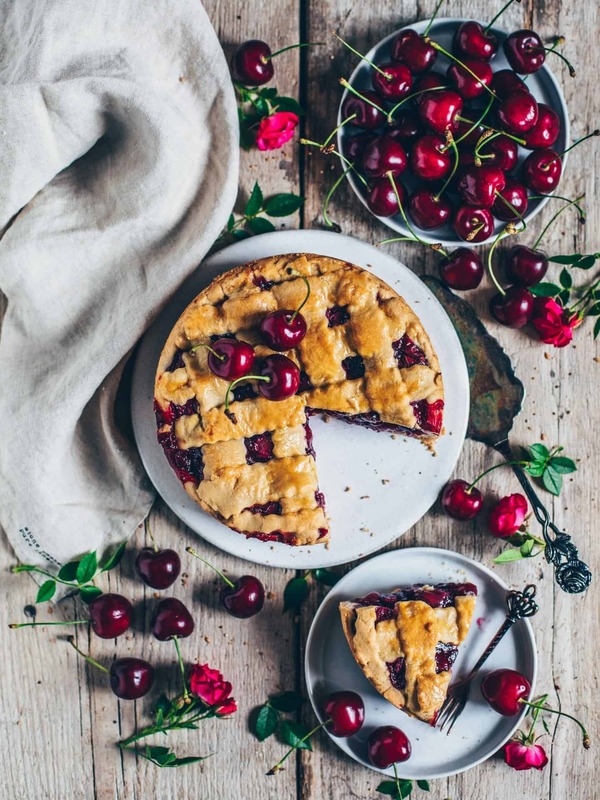 Your cherry pie looks amazing Bianca! The cherries look like jewels, so sparkly and shiny! Would love to just grab a slice! Here in Germany we don’t use oz or cups but hopefully you’ll find a good converter. Let me know! Have fun trying the recipe. Hi Bianca. 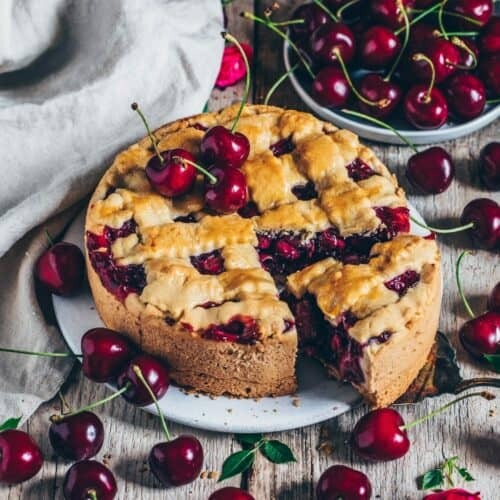 I love how fresh those cherries look. I love how plump and red they are. Kudos to you for sharing this recipe. So glad that you like the recipe! The pie crust recipe is perfect for making cookies or hand pies! Will definitely try a banana pie as well. Sounds so good to me. I love making this cake with apples either! Thank you so much for your comment. So happy that you liked the recipe. Hi Bianca, I tried this pie crust with apples and it tastes sooo good!! Hi Bianca can I use Frozen Cherries for the recipe ? It looks so good !! Yes, you can use frozen cherries.